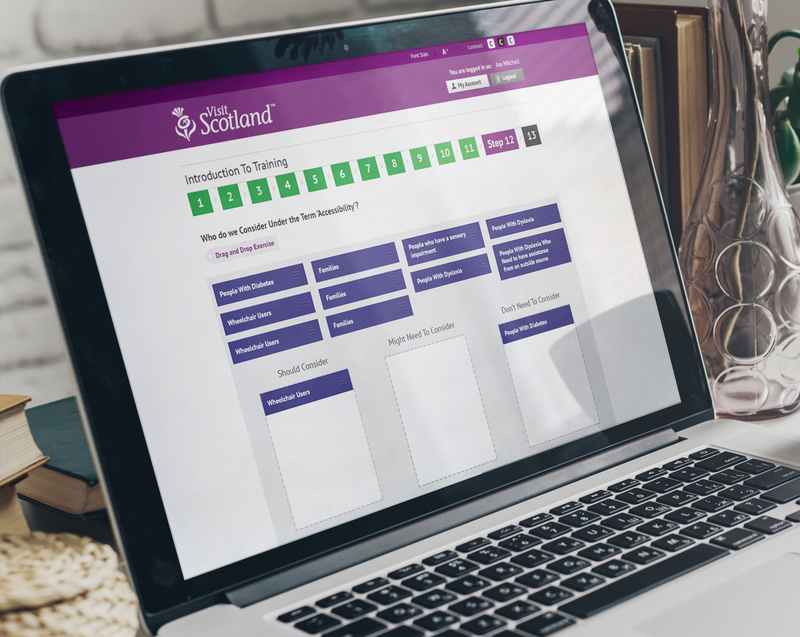 A bespoke, fully compliant training portal for VisitScotland, the official consumer website of Scotland’s national tourist board. Disabled and elderly visitors with access needs represent a significant proportion of the Scottish tourism marketplace. VisitScotland had been working with the tourism industry on the training and development of accessible tourism within the tourism/hospitality sector. However, classroom training alone could not reach the required numbers and, following evaluation, it was decided that this training will be rolled out across Scotland so the whole country can benefit from this emerging market; small, medium and large business will have access to this valuable training programme. Be engaging and fun to complete using interactive and lively graphics; vox-pops, etc. 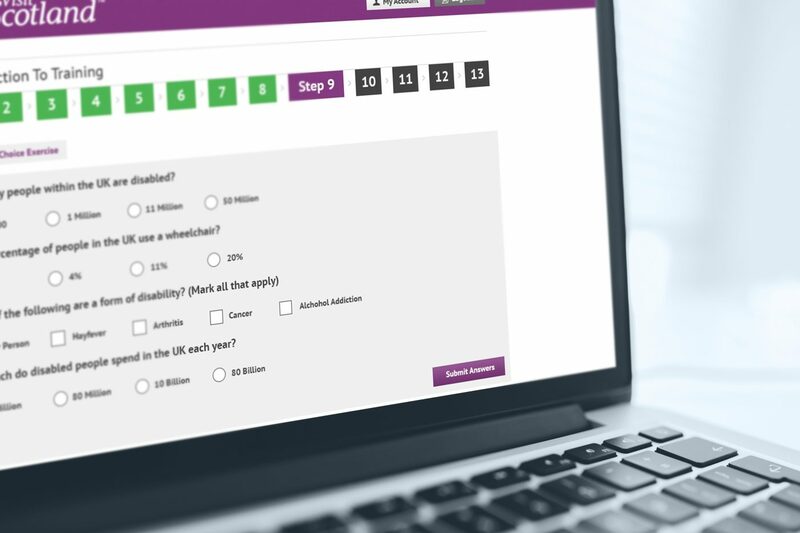 PureNet delivered a solution in partnership with its client DisabledGo which allow participants to complete training modules at their own pace, dip in and out and pick up at last completed point. It provided ongoing assessment and results to allow progression and certification on completion. Reflects the needs of all sectors with accessibility requirements, e.g. disabled, older, families with children etc. VisitScotland’s new solution has delivered fantastic results with the system being commissioned long past its initial conceived term. Chris McCoy, VisitScotland Accessible Tourism Scotland project manager, believes the biggest barriers facing those with access needs, such as poor customer service and a lack of information, are addressed in the new e-learning programme. In its latest report, VisitScotland noted a 16% increase in industry referrals. Visit Scotland has seen an increase in Accessible Tourism spend of £45m. The Portal is part of a new £45,000 Visit Scotland online training programme. Average time it takes to complete the course that has been widely adoped.